Matt Shepard Is a Friend of Mine: Documentary about Matthew Shepard, reviewed by John Darnielle. A new documentary shows that the loss of Matthew Shepard will be with his family and friends forever. 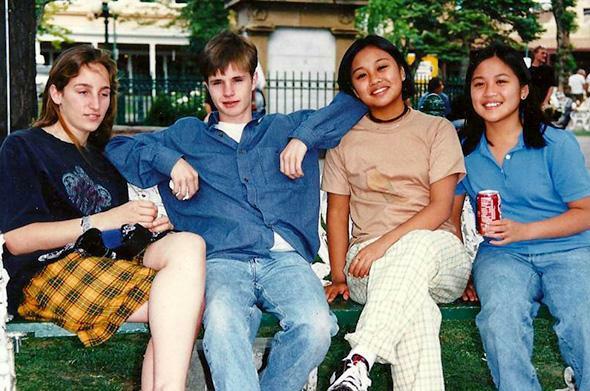 Matthew Shepard, second left, and Michele Josue, second right, in an archival photo from Matthew Shepard Is a Friend of Mine. The director of the film Matt Shepard Is a Friend of Mine is Michele Josue, who knew Matthew Shepard when they were both children. It’s the sort of film one feels a little crass reviewing, an intensely personal work made by a person attempting to struggle through profound grief. Reflection, not analysis, seems the more fitting response. The documentary consists mostly of interviews with Shepard’s friends and family, and of Josue’s memories of her friend: their correspondence, the things they did and didn’t share with each other. These are interspersed with archival footage, first of Shepard throughout his life, and then, later, cut-ins from TV news, broadcasting from Laramie, Wyoming, where Matthew Shepard was murdered at the age of 21. Matthew Shepard’s murderers singled him out because he was gay. His death in 1998 attracted the attention of the world beyond Wyoming, due in part to the horror of the crime: His murderers lured him to a remote area, beat him savagely, and left him with his hands tied behind his back in the middle of nowhere. His brain stem was damaged in the attack. It took him days to die. More detailed accounts of the crime, and of Shepard’s death, are excruciating to hear; they speak of human cruelty, of hard things to know about the world we live in. A handsome young man who hadn’t yet fully arrived in his adult body, Shepard smiled out through the braces on his teeth in the papers, on the evening news, and on the then-growing Internet, where word of the attack spread to all corners of the globe. His name became a rallying cry. His death illuminated for many the real threat of violence with which LGBTQ men and women live every day of their lives. Gently but persistently, Josue returns to Shepard’s parents. “This is what they’re here for, to see us cry,” his mother says, accurately, when the media have descended on Laramie. She gives a full and unsparing account of the attack and the aftermath, of her son’s final hours. His plainspoken father, Dennis, tries to give a clear picture of what Matthew Shepard was like in life—what his hopes were, what it was like to know him. What it felt like to be his father when he seemed to be struggling. Of Matthew coming out to his parents. In one of several very difficult moments of deep feeling toward the film’s end, at the site where his son was left for dead, Dennis reads from a statement he originally read at trial while accepting a guilty plea in exchange for a life sentence: “My first-born son, and my hero,” he says, twice. It is hard, as an onlooker, to bear, but it deserves to be borne. There’s occasional awkwardness in first-time director Josue’s film: some gratuitous zooms and unnecessary resolves, a good handful of stock documentary transitional scenes. What does it matter? There is more to art than aesthetics. There’s bearing witness. This film does just that, somewhat bluntly at times, but beautifully. It ends on a note of hope—the hate-crimes legislation finally passed 11 years after Shepard’s death, the foundation established in his name—but the lingering mood, after the credits have rolled, is grief, which is greatly to the film’s credit, I think. The good doesn’t feel like it outweighs or outpaces the bad, the weight of the struggle: There’s some hope, sometimes, that someday it might, with vigilance and hard work. But there’s also despair, and hard questions. The only way around the hard questions is through them. Dana Stevens is on sabbatical.